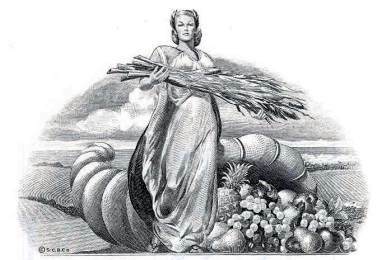 Home > Health Care, Food, Beer, Retail, Tobacco > Food, Beer and Beverage A-I > El Torito Restaurants, Inc. 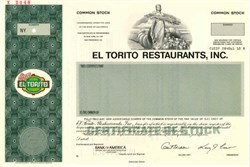 Beautifully engraved SPECIMEN certificate from the El Torito Restaurants, Inc.. This historic document was printed by the Security-Columbian Banknote Company in 1984 and has an ornate border around it with a vignette of an allegorical woman. This item has the printed signatures of the Company’s President and Secretary and is over 18 years old. El Torito Restaurants, Inc. is a multiple concept international restaurant company. They operate Mexican casual restaurants in the Western and Mid-Western United States and franchise operations in Japan, Turkey and Middle East. Their purpose is simply to provide great tasting, high quality Mexican food and beverage in a fun and friendly atmosphere, for people who crave a quality dining experience.